In 2015 the Office of the State Archaeologist partnered with researchers from EarthView Environmental, Inc. and Tallgrass Historians L.C. on a project to create an inventory of historical, archaeological and natural resources related to the Mormon migration through Iowa. Lead by EarthView, this project was completed with financial support provided by the Federal Highway Administration with a Statewide Transportation Enhancement Grant awarded to Pathfinders Resource Conservation and Development (RC&D), as well as financial and in-kind assistance provided by the Iowa West Foundation, the Mormon Historic Sites Foundation, and Golden Hills RC&D. The ultimate goal of the Pathfinders RC&D was to identify, preserve, and develop the trails and associated points of interest as a historical resource for the state of Iowa. Site records, historical documents, and map resources were examined and previous studies by the National Park Service, the Iowa Department of Transportation, the Iowa Mormon Trails Association, local and county historical studies, and LDS scholars and historical studies were consulted. To further add to the accuracy of this study, contacts were made with all of the Mormon Trails Associations in Iowa (the state organization and the county associations) and the local and county historical societies and historic preservation commissions in the counties through which the Mormon migrations traveled. The inventory resulted in mapped locations for the main trails and many incidental and alternate routes, and also identified many associated points of interest such as cemeteries (Figure 1), inns, and cabins built by the migrants. Geographic information systems (GIS) technology was used to refine the placement of the trails using aerial photographs, LiDAR images (Figure 2), and high resolution topographic maps. Limited field work was conducted to verify and record a small sample of the many archaeological sites. Recorded sites include visible trail ruts (Figure 3), dugouts, camps, and buildings associated with the migration. 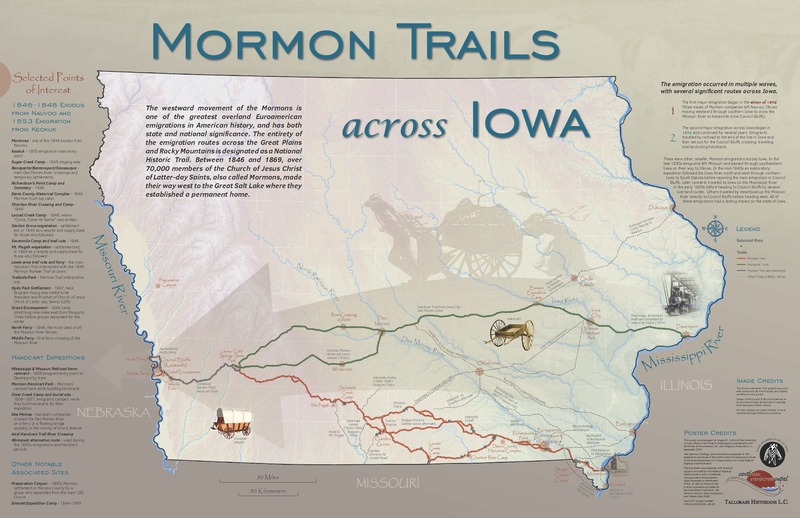 One of the end products associated with this project is a comprehensive map of Mormon Trails across Iowa with selected points of interest (Figure 4). For further details, contact OSA or Pathfinders RC&D.